Have you ever attended a local festival on your travels? 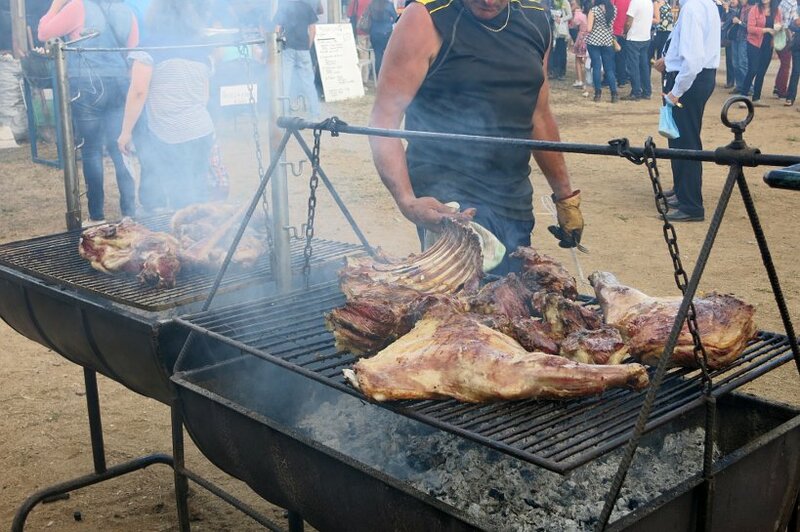 On our quest for Authentic Food in Chile, we stumbled onto a local festival in Talca our first stop in the country. But, why did we stop in Talca, Chile you may be wondering? Talca was our first stop in Chile after we left Argentina on our quest. We stopped in this important city for two reasons. 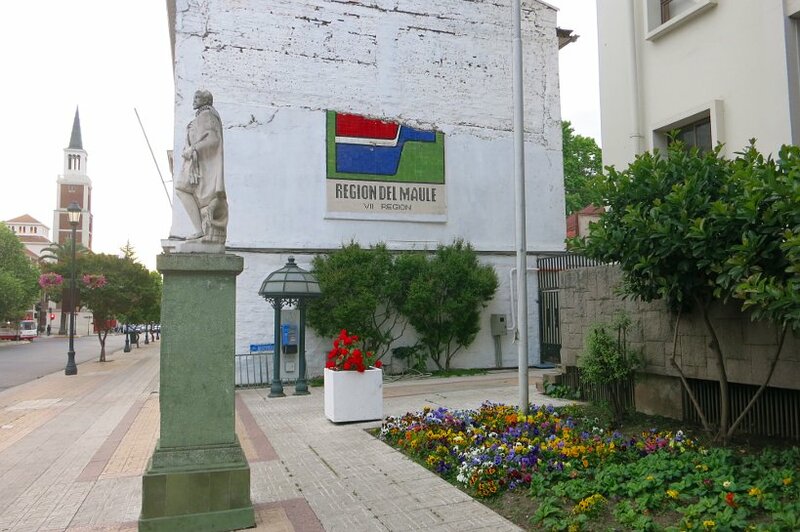 First, Talca is the birthplace of the country. This is where the Chilean Act of Independence was signed In 1818, by Bernardo O’Higgins, the liberator of Chile. Secondly, our stop in Talca was to discover the wines. Talca, which is in Maule Valley is where Chile’s first vines were planted in the 16th Century. This valley also has the oldest vines of the emblematic Carménère wine. 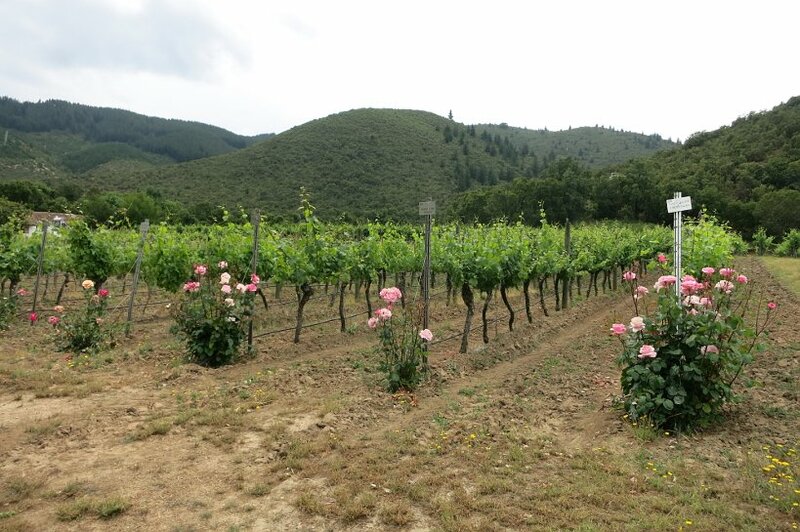 Read more here for the border crossing experience and wineries in Maule Valley. As we settled with our airbnb host, Rosita, she told us about a local festival we should attend to discover authentic Chilean food. The festival is called the Feria del Folclor de Huilquilemu. It takes place in Talca every November, and for four days, Chileans of the Maule region enjoy folkloric music and dancing, handicrafts, traditional food and drinks, and more. 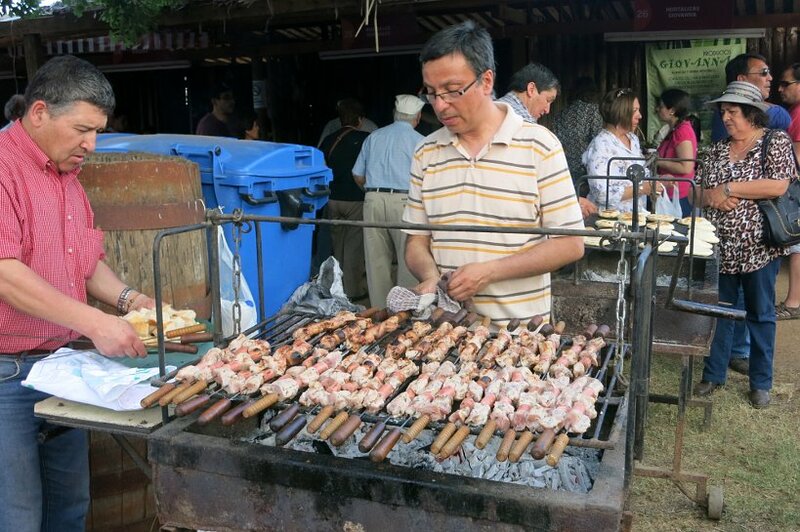 Never having been to a Chilean local festival, we were eager to discover the local culture and the food. With no expectations, we took the local bus and arrived at the festival about 30 minutes later. 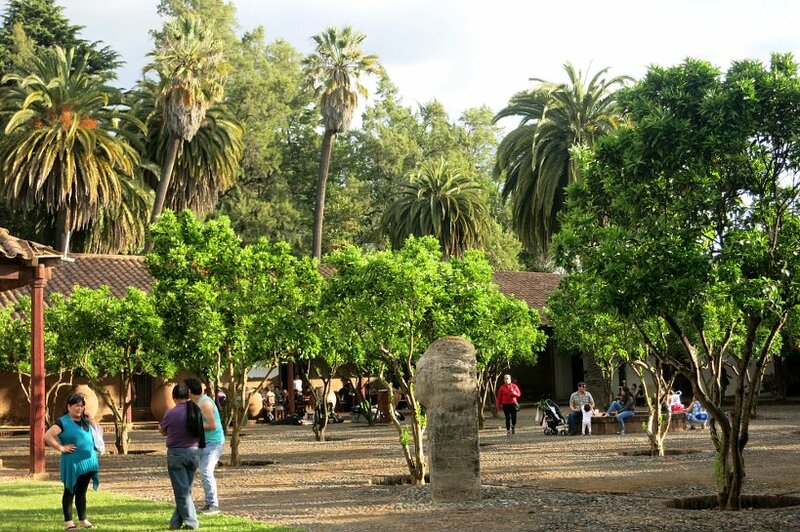 Located right outside the center of the city of Talca, the festival took place at Villa Cultural Huilquilemu. This cultural landmark and now museum, is where Bernardo O’Higgins was baptized. We arrived at about midday and were quite surprised both at the location and the number of people. It was a hot afternoon and the many families and young children were crowded in the shaded handicraft booths seeking relief from the hot sun. The place was spacious and some of the displays from the museum were open to the public. 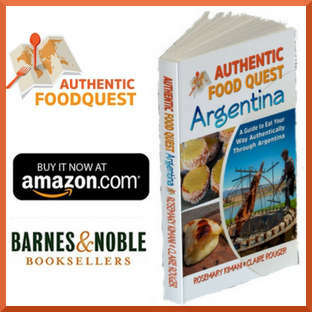 Being on the quest to discover the popular Chilean dishes and local specialties, food was the first thing on our minds. As we made our way toward the food stalls, we noticed some beautiful smooth rocks. They were used to grind ingredients so we stopped to learn more. With our limited Spanish, we engaged in a very interesting conversation with the local artisan. He told us about the origin of the stones and how they are traditionally used to make chancho en piedra. 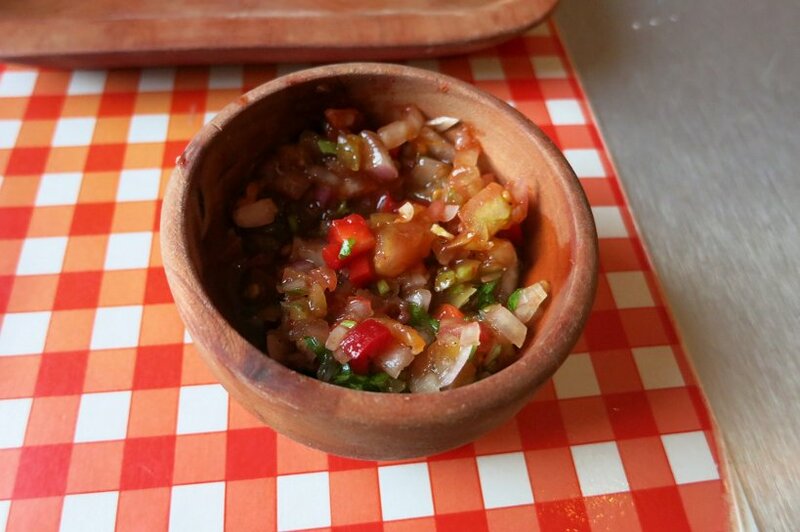 Chancho en piedra also referred to as pebre is a type of salsa that originated from Talca made to accompany meats. It is used in Chile like the chimichurri sauce is used for Argentina or pico de gallo in Mexico. Chancho en piedra literally means “pork in stones”. Despite its names, it has nothing to do with pork. It is said that “chanco”comes from the Quechua verb “chancar” which means “been crushed”. The stones which are river stones are round and smooth and used for crushing the tomatoes. Chancho en piedra is made from tomatoes, whole cumin, pepper, garlic, salt, green pepper, and oil. 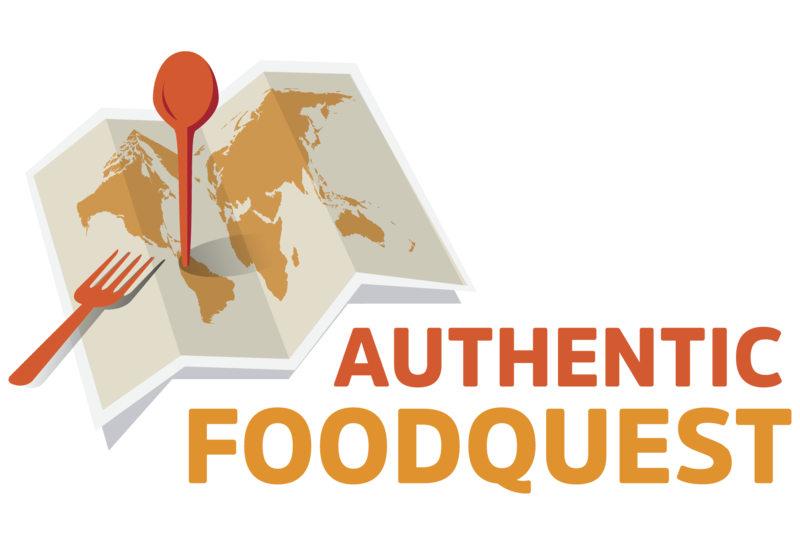 However, the ingredients vary by tradition, region and the preference of the cook. Typically pebre is not made with tomatoes although you will see this sauce with tomatoes called pebre in restaurants. The main idea is to offer a tasty marinade to enhance the flavor of grilled meats. Traditionally, no knife is used to cut the tomatoes and prepare chancho en piedra. Instead, the stones crush the tomatoes transforming them into a smooth and delicious paste. While Chileans may not have Argentina’s claim to fame for their barbecues, we were quite impressed with how much food was grilling on hot coals. There was chicken and sausages on skewers; beef, lamb and ribs on the grills. 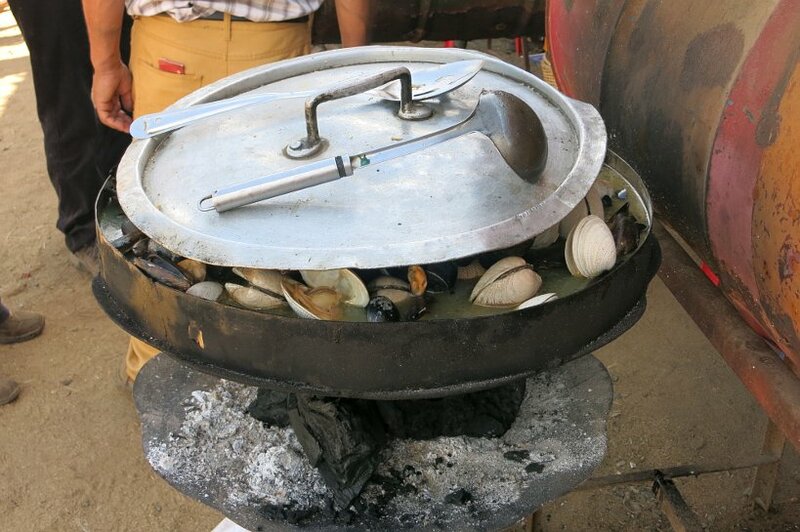 There were even preparing mussels and clams in giant pots over fire. What an unexpected surprise! The most surprising thing on the grill were the churrascas or pan chileno which were simple white bread cooking on the parilla (barbecue). As we were taking in the atmosphere and enjoying ourselves, we were struck by a strange looking drink on almost every table. After mustering up some courage in our limited Spanish, we asked a lady standing nearby what she was drinking. Mote con Huesillo is a traditional summertime drink made with wheat and peaches. While it was strange to see a huge peach in the cup, along with wheat, we found it surprisingly refreshing. You can read more about this famous drink and others in our previous post 6 famous Chilean drinks to experience like a local. 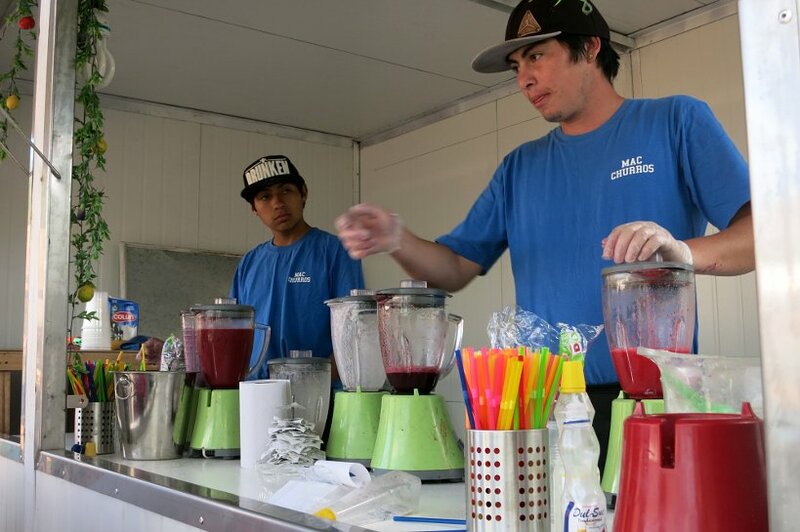 Fruit juices are very popular in Chile and can be found pretty much everywhere. 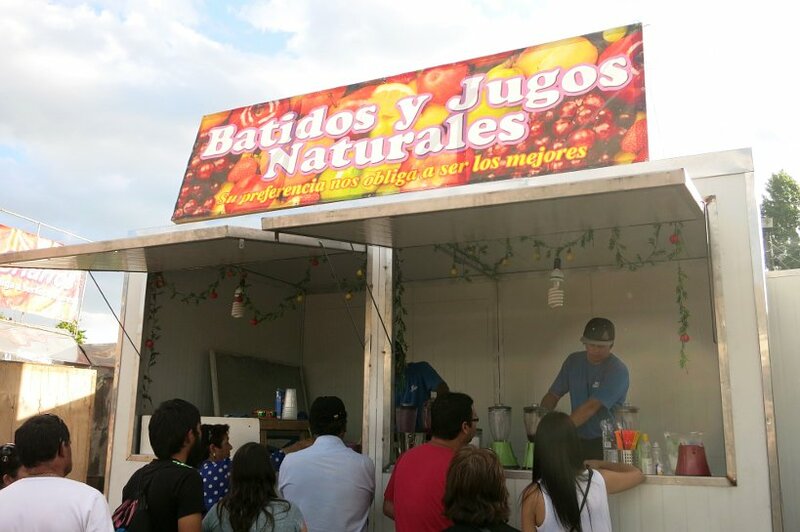 At restaurants, cafes, stalls and fairs, you can order your juice made fresh from the exotic fruits found in the country. 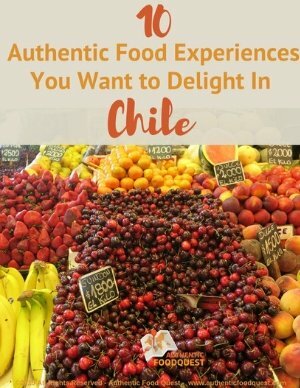 See more about the 6 exotic chilean fruits we discovered at farmers market in Santiago. Given the heat and the popularity of fruit juices, the lines to order the juices were quite long. Many were choosing from the popular flavors of frambuesa (raspberry), naranja (orange), or durazno (peach). At this point, we were no longer hungry or thirsty but were amazed at the popularity of the juices. In addition to the food and drinks, there was folklore music. The highlight was the discovery of traditional Polynesian dance from the Rapa Nui people of Easter Island (Isla de Pascua). Easter Island is a Chilean territory and is the world’s most isolated inhabited island. It is a Polynesian Island located in the Pacific ocean approximately 3,510 km (2,180 mi) west of continental Chile. We were pleasantly surprised to see the Rapa Nui and their traditional dance for the first time at this Chilean local festival. Their performance was magnetic. Their energy was captivating and they represented Easter Island with great pride. This performance was a favorite crowd pleaser. 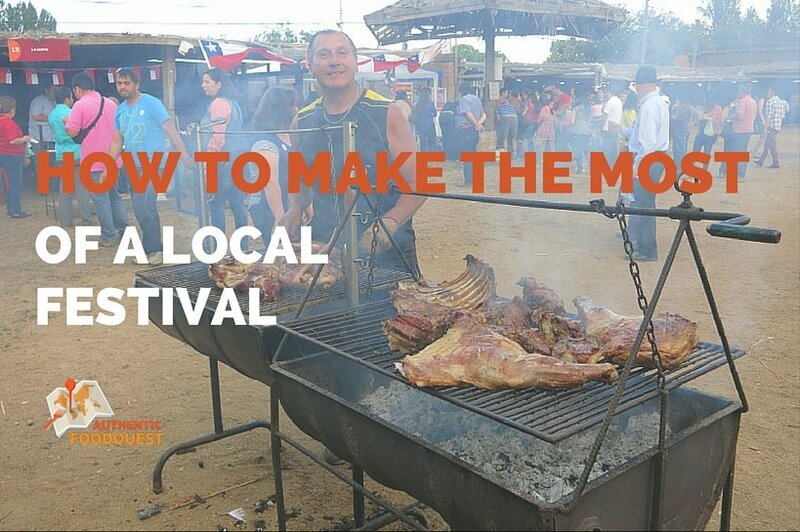 On your travels, don’t forget to look for the local festival for authentic experiences. We had not heard of this particular Chilean local festival before and it was not in our guide book. The only way we found out about it was from Rosita, our airbnb host. Connect with locals on your travels. Flip through the local newspaper. Even though you may not understand the language, you can at least get a sense of the local activities. Don’t forget to check with the tourist office and for a calendar of local events. To travel deeper and for more local experiences, be flexible with your itinerary and make room for a local festival and events. Be open and remain curious. 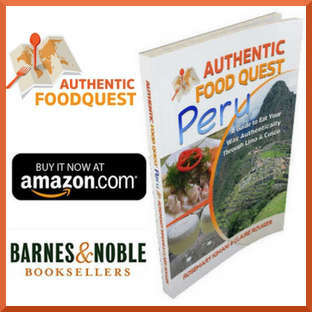 At these local events, you will be immersed in the cultural and will get the opportunity to taste the authentic foods. 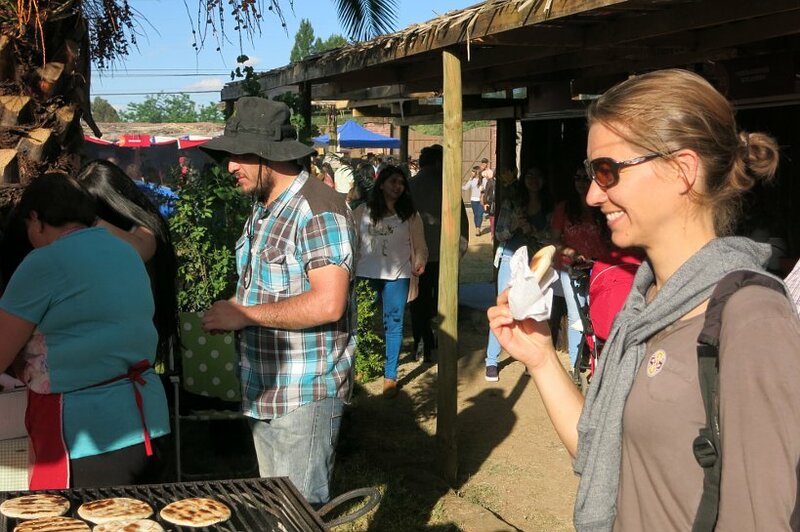 We were thrilled to have stumbled onto this Chilean festival in Talca. 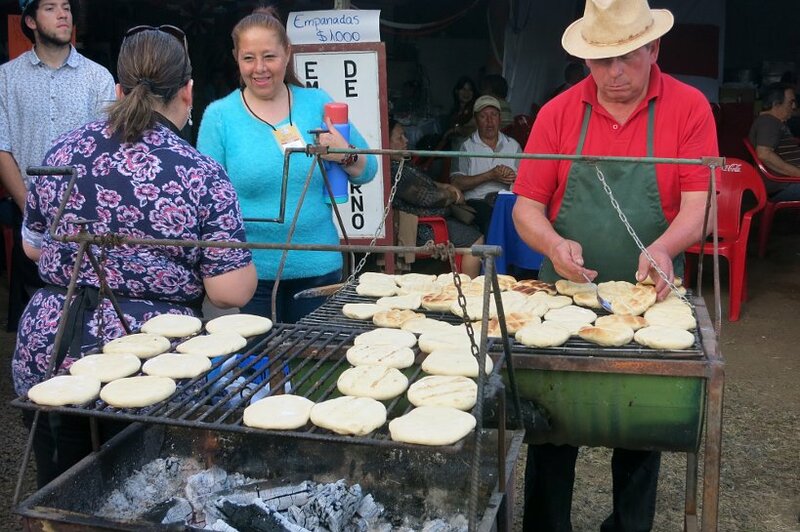 We got to discover Chancho en piedra, mote con huesillo and sample lots of delicacies from the grill. We were immersed in the local culture and saw Rapa Nui performers for the first time ever. What a wonderful introduction into the local Chilean food and culture. On your travels, what local festival have you attended and what did you discover? Share your comments below. 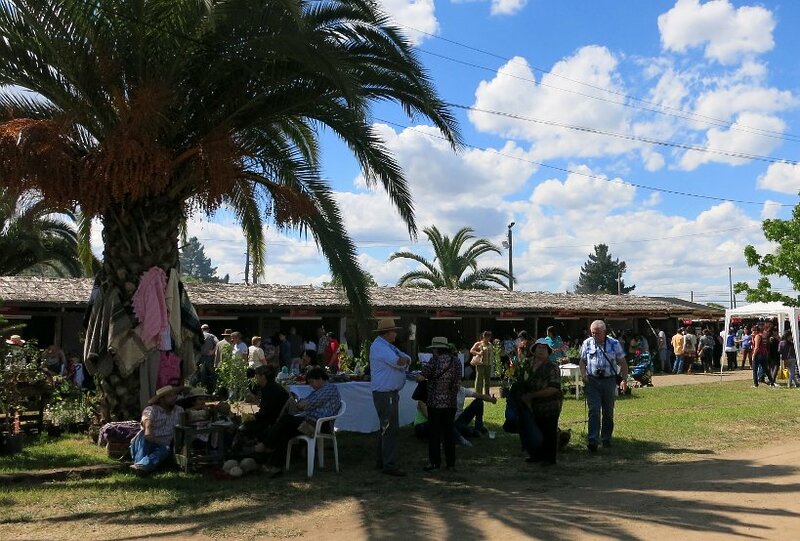 Feria del folclor de Huilquilemu, Villa Cultural Catholic University of Maule (UCM), located at kilometer 7 of Road to San Clemente. Great post. Food Festival looks like the one we have here in Qatar. Thanks Sahar! Food Festival in Qatar, that’s interesting! What food do they feature? Isn’t there a particular thrill in ‘stumbling’ upon a festival like this? I mean, if you had known about it and traveled there specifically for it, it would be fun but wouldn’t have the same excitement or that feeling of being in the right place at the right time! 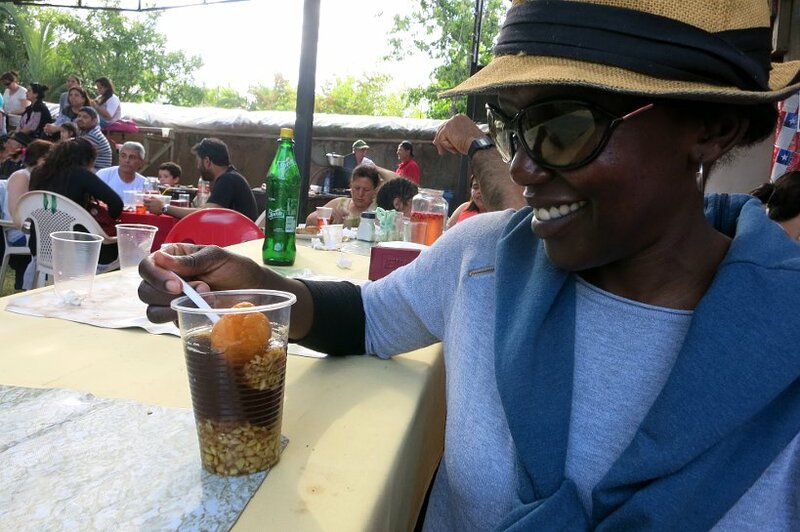 This happened to me last weekend actually, in Malta, though it was pouring rain, so the food festival lacked what I”m sure it had on subsequent days! My gosh! The pungent aromas wafting around must have been really heady stuff! I’m not even there, nor much of a meat eater, and my mouth is watering! Thanks Arnie! You’re so right, it was difficult not to indulge in the food. I’m pretty sure you would have liked the mote con huesillo or the pan chileno. Wow! Your photos and food descriptions take me back in time. As the child of American missionaries, I visited Chile the first time at age eleven, and then my family moved there two years later. We lived at various times in Viña del Mar, Temuco, Puyehue, and Osorno. I especially love your picture of the mussels and clams. Chilean seafood is incredible! I need to do a full-circle journey and revisit my childhood homes. I can’t wait to go back to Chile to visit the wine region. It is always nice to be in a region when a festival is going on as you get a chance to witness some of the traditions that you read about in guide books. When we were in Bermuda we got to participate in the annual Kite Festival. It was definitely a highlight of the trip. Thank you for your comment Christina! Chile have great wine regions to visit. The wineries are nice to tour and we enjoyed the tastings 🙂 We love the Carménère, the Cabernet-Sauvignon, and their sparkling wine is fine. Agree local festivals are a great way to immerse in the local culture. Looks like a great festival. Going to festivals in new places is such a great way to get a dose of local culture. It was a great and unexpected festival. So glad to have had the chance to see Rapa Nui dancers and try the traditional and local foods. Yes, so right, local festivals is a great way to get engaged 🙂 Thanks for your comments. The stone bowls were incredibly smooth. So interesting learning how they use them. I’m not sure where you can find them, perhaps on a trip to Chile 🙂 Glad you go to local festivals too…truly the best way to experience the local culture. Thanks Fiona. The food was incredibly local and quite delicious. It’s always fun to run into unexpected local festivals. Thanks for your comments. 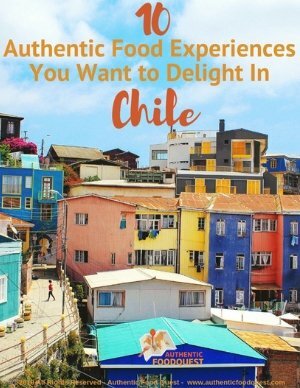 Nothing beats authentic food from the origins itself and as you showed it, Chilean food’s no exception. I’m thinking maybe those white bread might be used as some kind of Pita to enclose meat like shawarma or burrito but I’m just guessing! And come to think of it, this is a folklore event so the expectations are just bar high when it comes to food quality, I bet! Hi, the white bread was eaten just plain and just hot off the grill. This particular item always had long lines of people waiting to get their bread. Not as a pita or burrito, just plain to eat with a meal or snack. Very simple ingredients and quite delicious 🙂 Thanks for your comments. That is, hands down, the best way to travel, eat and meet locals. Looks like such an awesome festival and I want Chancho en piedra. I came across a local festival once in Chicago in a Hispanic neighborhood. Had lots of similar things but my best find was a frozen cheesecake slice dipped in chocolate on a stick lol. 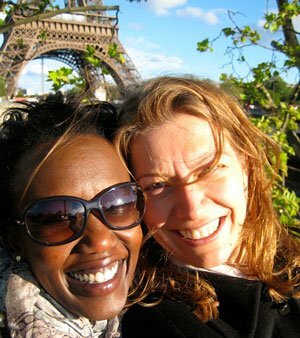 That’s amazing Evelyne …festivals are truly a great way to get into the local culture. Having lived in Chicago for many years I know exactly what you are talking about – frozen cheesecake slice dipped in chocolate on a stick 🙂 Did you have fun ? The food looks amazing, I like those grinding stones. 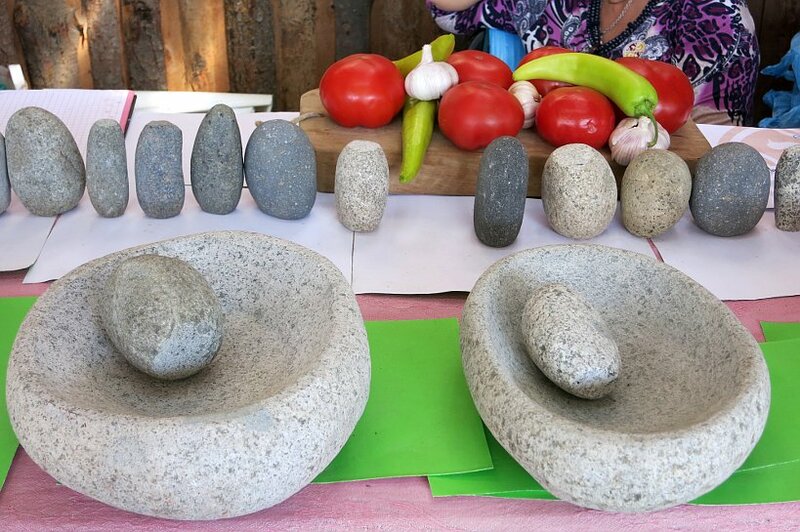 It seems like a hybrid between a mortar and pestle and similar flat stones used in India for grinding. I think the curved bowl like shape would make life much easier than a flat surface! Great tips as always. Thanks Prateek. You are right, it is amazing to see similar products used across the world for different things. Unfortunately, they were not demonstrating the use of the stones, would have liked to see that 🙂 Thanks for your comments. Looks great 🙂 I went to a local cultural festival in Reykjavik, Iceland, and that was awesome. It made me think we could do stuff like this much better in the UK! That’s fantastic Shannon, how was the local festival in Reykjavik? Did you experience anything new and different that you would otherwise have not? Wherever we are, it’s important to attend the local events to immerse ourselves in the local culture 🙂 Thanks for your comments. Wow, 4 days of music, wine, handicrafts and food, sounds like quite an experience! All that food looked pretty impressive. Hi Elissa, we were only there for one day and that was already quite a bit of fun. Quite local and different. Do you attend local festivals on your travels? I love that you received a recommendation to attend this festival from your AirBnB host. That’s one of the best parts of being part of the shared economy! Looks like you got to try some delicious food. Thanks Lauren. We absolutely love Airbnb and have gotten so many “inside tips” from locals. This one of them. Agree, love the shared economy….and yes, the food was great. Thanks for your comments! This is a great reminder to get away from the guidebook sometimes and act more like a local! 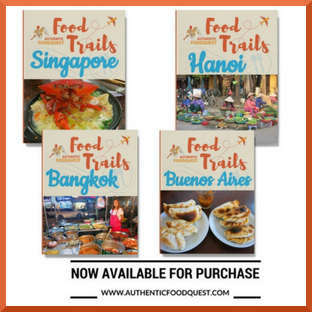 While i have not stumbled onto a food festival like this, i often read the newspaper in Hawaii to get more of a local experience on what was going on in town! Great to hear Lindsay that you look at the local papers too. Great finds there. It does help to step away from the guide book and let the locals guide. Appreciate your comments. Glad we travel in a very similar manner! When I was in Chile someone told me that pebre might be with or without tomatoes – there’s no wrong way of preparing it as it depends on the tradition of a household. Hi Monika, you are completely correct. Pebre is served in a variety of ways by household and by region as well. Both with tomatoes and without are very tasty and delicious. Do you have a preference of how you like it? Oh wow, I love Chile and I didn’t know they have a lovely festival like this!